The Sun in Taurus people are down-to-earth. They know perfectly well what they want out of life. According to astrology, Taurus is an earth sign, and the Sun in Taurus makes them even more grounded. The Sun represents one’s originality, and this plays into a Taurean’s stubborn nature. Once they decide to do something, for themselves or others, there’s no getting in their way. They have made up their mind. The Taurus person loves the physical nature of things – the feel of soft fabrics or comfortable clothing help to calm them and put them in a more relaxed state of mind. Taureans are hard-working people, and sometimes that strong work ethic can interfere with other areas of their lives. They are constantly planning the best way to do something, whether, in their career, relationships, or home life, and their rigid nature can be exhausting sometimes. The Sun in Taurus either makes them really concerned with work or really obsessed with pleasure. And whatever the choice, there is no changing their mind. 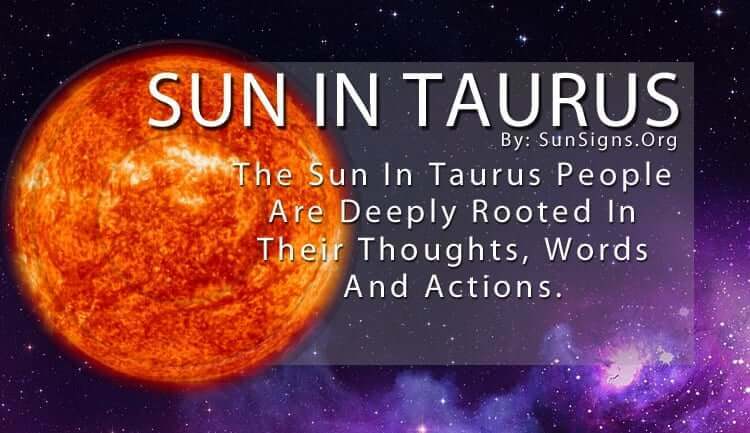 The Taurus Sun people are deeply rooted in their thoughts, words and actions. Everything they do is deliberate and carefully calculated. So whether they are planning a business meeting or planning a vacation, they put the same amount of effort into it. They need stability and security, which means they work hard to obtain the things they want to help them relax. And with the Sun in Taurus, that amps up the intensity they give to doing nothing. Now, that isn’t to say they won’t get up and go back to work, or neglect their duties in some way. They take their responsibilities very seriously and pride themselves on being punctual and efficient. But they know when they need a good rest, and they know what they need to obtain one. They have carefully plotted out every detail for maximum work. They do the same when it comes to ultimate pleasure. And when it is pleasure, not work, the Sun in Taurus people are utterly and completely lazy. They know how to truly kick back and let life pass them by while they enjoy the quiet comforts of home. Because they enjoy material possessions, their household has plenty of entertainment at their disposal. This sometimes brings out the possessive nature in Taurus zodiac sign people, who like acquiring “things” throughout their lifetime. Even though they are not jealous people, they do enjoy the thought of something, or even someone, belonging to them. Having all of these possessions helps them to feel more confident and secure. The Taurus Sun people go after something with a lot of passion. The Taurus Sun sign are not emotional people, as they aspire to be as rational and logical as possible. But they do have a tenacity that is difficult to break. Once they’ve made up their mind to go after something it will be theirs eventually. It might take more time than say, a fire sign, in going after the same thing. But Taurus is patient and smart, and their calculated manner gets results. Sometimes it requires being as patient as they are, in dealing with the Sun in Taurus people. If you push them too far they will unleash their outrageous temper. Be careful not to reach this level. Then it takes time for them to come down from the anger and resentment. But follow along their path with them, and you’ll have a steady friend, ally, or romantic partner for life.